In a clean, properly-maintained environment, rats are tidy animals that groom themselves regularly. However, over time, a urine smell can build up inside their cages. This odor isn't just unpleasant, it's actually harmful to rats. Ammonia buildup can permanently damage these small animals' lungs. Disinfecting the rats' cage with non-toxic chemicals each time it's cleaned can help reduce odors and keep pets healthy. Vinegar contains about 5 percent acetic acid. It's a mild bactericide, killing a range of unpleasant microbes that reproduce in soiled bedding. It also reacts with the ammonia in rat urine to neutralize its odor. Vinegar washes away with water and leaves no dangerous residue behind. In very strong solutions, vinegar may leave behind a slight acidic odor, which fades with time. Dilute the vinegar further, or allow the cage to dry in a well-ventilated area before returning the rats to their home. Hydrogen peroxide comes in two grades, medical and technical. Medical hydrogen peroxide is readily available from drugstores and contains about 3 percent of this chemical. It's mildly bactericidal and also kills viruses and fungi. This chemical oxidizes other substances on contact, decomposing into water and oxygen gas. It leaves behind no residue or smell. Hydrogen peroxide is commonly used as a color-safe laundry bleach, and may remove stains from rat cages as well as odor. Baking soda, or sodium bicarbonate, is an absorbent material that soaks up airborne odors. Many people use an open box or bowl of baking soda in the refrigerator to remove unpleasant smells. The same principle works on rat smells. Sprinkle a little baking soda in the bottom of the cage before adding litter, or simply place an open container of baking soda close to the rat cage to cut down on odors. This technique does not allow less frequent cage cleaning, but can reduce odors in a small space with poor ventilation. Change the baking soda frequently for best effectiveness. 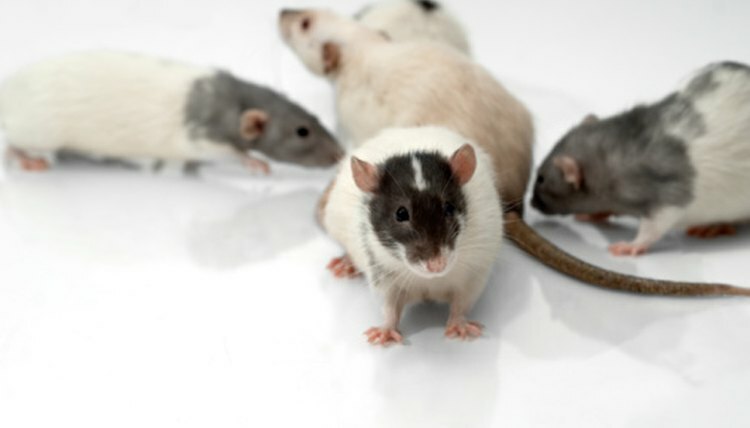 Several natural chemicals, added to rats' feed or water, work to reduce urine odors. These products are sold under a number of brand names, but usually contain either amino acids or Mojave yucca, which cause rats to produce less foul-smelling urine. According to the Rat and Mouse Club of America, both of these substances are safe feed supplements when used as directed.